"Hatfields & McCoys" redirects here. For the TV miniseries, see Hatfields & McCoys (miniseries). 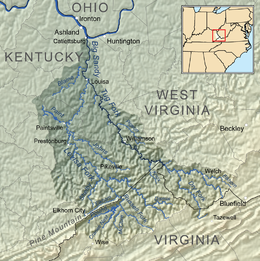 The Hatfield–McCoy feud, also known to journalists as the Hatfield–McCoy war, involved two rural families of the West Virginia–Kentucky area along the Tug Fork of the Big Sandy River in the years 1863–1891. The Hatfields of West Virginia were led by William Anderson "Devil Anse" Hatfield while the McCoys of Kentucky were under the leadership of Randolph "Ole Ran'l" McCoy. Those involved in the feud were descended from Ephraim Hatfield (born c. 1765) and William McCoy (born c. 1750). The feud has entered the American folklore lexicon as a metonym for any bitterly feuding rival parties. More than a century later, the feud has become synonymous with the perils of family honor, justice, and revenge, recently brought to light again from the documentary, "Hatfields vs. McCoys." William McCoy, the patriarch of the McCoys, was born in Ireland around 1750 and many of his ancestors hailed from Scotland. The family, led by grandson Randolph McCoy, lived mostly on the Kentucky side of Tug Fork (a tributary of the Big Sandy River). The Hatfields, led by William Anderson "Devil Anse" Hatfield, son of Ephraim and Nancy (Vance) Hatfield, lived mostly on the West Virginia side. The majority of the Hatfields, although living in Mingo County (then part of Logan County), West Virginia, fought on the Confederate side in the American Civil War; most McCoys, living in Pike County, Kentucky, also fought for the Confederates; with the exception of Asa Harmon McCoy, who fought for the Union. The first real violence in the feud was the death of Asa Harmon McCoy as he returned from the war, murdered by a group of Confederate Home Guards called the Logan Wildcats. Devil Anse Hatfield was a suspect at first, but was later confirmed to have been sick at home at the time of the murder. It was widely believed that his uncle, Jim Vance, a member of the Wildcats, committed the murder. The Hatfields were more affluent than the McCoys and were well-connected politically. Devil Anse Hatfield's timbering operation was a source of wealth for his family, while the McCoys were more of a lower-middle-class family. Ole Ran'l owned a 300-acre (120 ha) farm. Both families had also been involved in the manufacturing and selling of illegal moonshine, a popular commodity at the time. Asa Harmon McCoy joined the 45th Kentucky Infantry on October 20, 1863. According to his Compiled Service Records, he was "captured by Rebels" on December 5, 1863, and was released four months later to a Union hospital in Maryland. At the time of his capture, he was recovering from a gunshot wound to the chest. During the early months of the Civil War he joined a company of the Pike County Home Guards, under the command of Uriah Runyon, and it is thought he sustained the wound while serving in this unit. William Francis also led a company of Pike County Guards during 1862 and a group of his guards attacked and shot Mose Christian Cline, a friend of Devil Anse Hatfield. Although Cline survived his wounds, Anse Hatfield vowed to retaliate against the responsible parties. Some time in 1863, a group of Confederate Home Guards ambushed and killed William Francis as he was leaving his house, and Anse Hatfield took credit for the deed. Uriah Runyon later joined the 39th Kentucky Infantry and was killed on May 7, 1864, in Pike County, Kentucky. His Compiled Service Records say "Killed by Rebels". On muster rolls beginning on May 6, 1864, Asa Harmon McCoy is reported in a Lexington hospital, suffering from a leg fracture. Beginning in December 1864, the 45th Kentucky Infantry began mustering its regiments out of service. Asa Harmon's Company E was mustered out on December 24, 1864, in Ashland, Kentucky. He was killed near his home on January 7, 1865, just thirteen days after leaving the Union Army. A group of Confederate guerillas took credit for the killing and his wife's pension application states that he was "killed by Rebels". There are no existing records pertaining to his death and no warrants were issued in connection with the murder. McCoy family tradition points to James "Jim" Vance, an uncle of Anse Hatfield and a member of a West Virginia Militia group, as the culprit. The second recorded instance of violence in the feud occurred thirteen years later, in 1878, after a dispute about the ownership of a hog: Floyd Hatfield, a cousin of Devil Anse's, had the hog, but Randolph McCoy claimed it was his, saying that the notches on the pig's ears were McCoy, not Hatfield, marks. The matter was taken to the local Justice of the Peace, Anderson "Preacher Anse" Hatfield, who ruled for the Hatfields by the testimony of Bill Staton, a relative of both families. In June 1880, Staton was killed by two McCoy brothers, Sam and Paris, who were later acquitted on the grounds of self-defense. 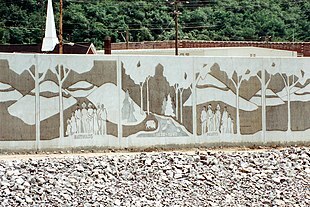 A section of the flood wall along the Tug Fork in Matewan, West Virginia, constructed by the U.S. Army Corps of Engineers, depicts the Hatfield–McCoy feud. The feud escalated after Roseanna McCoy entered a relationship with Devil Anse Hatfield's son Johnson, known as "Johnse" (spelled "Jonce" in some sources), leaving her family to live with the Hatfields in West Virginia. Roseanna eventually returned to the McCoys, but when the couple tried to resume their relationship, Johnse Hatfield was arrested by the McCoys on outstanding Kentucky bootlegging warrants. He was freed from McCoy custody only when Roseanna made a desperate midnight ride to alert Devil Anse, who organized a rescue party. The Hatfield party surrounded the McCoys and took Johnse back to West Virginia before he could be transported the next day to the county seat in Pikeville, Kentucky. Despite what was seen as her betrayal of her own family on his behalf, Johnse Hatfield thereafter abandoned the pregnant Roseanna for her cousin, Nancy McCoy, whom he wed in 1881. The feud continued in 1882 when Ellison Hatfield, brother of Devil Anse, was killed by three of Roseanna McCoy's younger brothers: Tolbert, Pharmer, and Bud. On an election day in Kentucky, the three McCoy brothers fought a drunken Ellison and his other brother; Ellison was stabbed 26 times and finished off with a gunshot. The McCoy brothers were initially arrested by Hatfield constables and were taken to Pikeville for trial. Secretly, Devil Anse Hatfield organized a large group of followers and intercepted the constables and their McCoy prisoners before they reached Pikeville. The brothers were taken by force to West Virginia, to await the fate of mortally wounded Ellison Hatfield and when Ellison died from his injuries, the McCoy brothers were killed by the Hatfields' vigilante justice in turn: being tied to pawpaw bushes, where each was shot numerous times with a total of 50 shots fired. Their bodies were described as "bullet-riddled". Even though the Hatfields and most inhabitants of the area believed their revenge was warranted, up to about twenty men, including Devil Anse, were indicted. All of the Hatfields eluded arrest; this angered the McCoy family, who took their cause up with Perry Cline. Cline was married to Martha McCoy. Historians believe that Cline used his political connections to reinstate the charges and announced rewards for the Hatfields' arrest as an act of revenge. A few years prior, Cline lost a lawsuit against Devil Anse over the deed to thousands of acres of land, subsequently increasing the hatred between the two families. In 1886, Jeff McCoy killed a mail carrier named Fred Wolford, and the man who went to pursue him for his crime was acting constable Cap Hatfield. Cap and a friend named Tom Wallace shot him while on the run on the banks of Tug River. Tom Wallace was soon found dead in the spring of 1887. The feud reached its peak during the 1888 New Year's Night Massacre. Cap Hatfield and Jim Vance led several members of the Hatfield clan to surround the McCoy cabin and opened fire on the sleeping family. The cabin was set on fire in an effort to drive Randolph McCoy into the open. He escaped by making a break for it, but two of his children were shot and his wife was beaten and almost killed. With his house burning, Randolph and his remaining family members were able to escape to the woods; his children, unprepared for the elements, suffered frostbite. The remaining McCoys moved to Pikeville to escape the West Virginia raiding parties. Between 1880 and 1891, the feud claimed more than a dozen members of the two families. On one occasion, the governors of West Virginia and Kentucky even threatened to have their militias invade each other's states. In response, Kentucky Governor S. B. Buckner sent his Adjutant General Sam Hill to Pike County to investigate the situation. More than a dozen people died and at least 10 people were wounded. A few days after the New Year's Massacre, a posse led by Pike county deputy sheriff Frank Philipps rode out to track down Devil Anse's group across the border into West Virginia. The posse's first victim was Jim Vance, who was killed in the woods after he refused to be arrested. Philipps then made other successive raids on Hatfield homes and supporters and captured three before cornering the rest in Grapevine Creek on 19 January. Unfortunately for Philipps, Devil Anse and other Hatfields were waiting for them with an armed group of their own. A battle ensued between the two parties, and the Hatfields were eventually apprehended. Two Hatfield supporters were killed, and a deputy, Bill Dempsey, was executed by Frank Philipps after they surrendered. Wall Hatfield and eight others were arrested and brought to Kentucky to stand trial for the murder of Alifair McCoy (sometimes spelled Allaphare, Randolph's young daughter), killed during the New Year's Massacre. Because of issues of due process and illegal extradition, the United States Supreme Court became involved (Mahon v. Justice, 127 U.S. 700 (1888)). The Supreme Court ruled 7–2 in favor of Kentucky, holding that, even if a fugitive is returned from the asylum state illegally, instead of through lawful extradition procedure, no federal law prevents him from being tried. Eventually, the men were tried in Kentucky and all were found guilty. Seven received life imprisonment, while the eighth, Ellison "Cottontop" Mounts, was executed by hanging. Thousands attended the hanging in Pikeville. Valentine "Uncle Wall" Hatfield, elder brother of Devil Anse, was overshadowed by Devil Anse's ambitions but was one of the eight convicted, dying in prison of unknown causes. He petitioned his brothers to assist in his emancipation from jail but none came for fear of being captured and brought to trial. He was buried in the prison cemetery, which has since been paved over. William Anderson "Devil Anse" Hatfield, the younger and more militant brother of Valentine Hatfield, led the clan in most of their combative endeavors. Doc D. Mahon, son-in-law of Valentine and brother of Pliant, one of the eight Hatfields convicted, served 14 years in prison before returning home to live with his son, Melvin. Pliant Mahon, son-in-law of Valentine, served 14 years in prison before returning home to rejoin his ex-wife, who had remarried but left her second husband to live with Pliant again. Fighting between the families eased following the hanging of Mounts. Trials continued for years until the 1901 trial of Johnse Hatfield, the last of the feud trials. In 1979, the families united for a special week's taping of the popular game show Family Feud, in which they played for a cash prize and a pig which was kept on stage during the games. The McCoy family won the week-long series three games to two. While the Hatfield family won more money – $11,272 to the McCoys' $8,459—the decision was made to augment the McCoy family's winnings to $11,273. 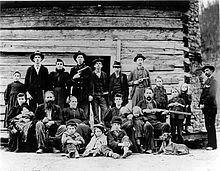 Great-great-great grandsons of feud patriarch Randolph McCoy, Bo McCoy of Waycross, Georgia, and his cousin, Ron McCoy of Durham, North Carolina, organized a historic joint family reunion of the Hatfield and McCoy families in 2000. More than 5,000 people attended the reunion, which attained national attention. The Hatfield–McCoy feud is featured in a musical comedy dinner show in Pigeon Forge, Tennessee. In 2002, Bo and Ron McCoy brought a lawsuit to acquire access to the McCoy Cemetery which holds the graves of six family members, including five slain during the feud. The McCoys took on a private property owner, John Vance, who had restricted access to the cemetery. In the 2000s, a 500-mile (800 km) all-terrain vehicle trail system, the Hatfield–McCoy Trails, was created around the theme of the feud. On June 14, 2003, in Pikeville, Kentucky, the McCoy cousins partnered with Reo Hatfield of Waynesboro, Virginia, to declare an official truce between the families. Reo Hatfield said that he wanted to show that if the two families could reach an accord, others could also. He had said that he wanted to send a broader message to the world that when national security is at risk, Americans put their differences aside and stand united: "We're not saying you don't have to fight because sometimes you do have to fight," he said. "But you don't have to fight forever." Signed by more than sixty descendants during the fourth Hatfield–McCoy Festival, the truce was touted as a proclamation of peace, saying "We ask by God's grace and love that we be forever remembered as those that bound together the hearts of two families to form a family of freedom in America." Governor Paul E. Patton of Kentucky and Governor Bob Wise of West Virginia signed proclamations declaring June 14 Hatfield and McCoy Reconciliation Day. Ron McCoy, one of the festival's founders, said it is unknown where the three signed proclamations will be exhibited. "The Hatfields and McCoys symbolize violence and feuding and fighting, but by signing this, hopefully people will realize that's not the final chapter", he said. In 2011, the Hatfields and McCoys Dinner Show, a musical comedy production, opened in the resort community of Pigeon Forge, Tennessee, near the entrance to the Great Smoky Mountains National Park. The Hatfield and McCoy Reunion Festival and Marathon are held annually in June on a three-day weekend. The events take place in Pikeville, Kentucky, Matewan, West Virginia, and Williamson, West Virginia. The festival commemorates the famed feud and includes a marathon and half-marathon (the motto is "no feudin', just runnin'"), in addition to an ATV ride in all three towns. There is also a tug-of-war across the Tug Fork tributary near which the feuding families lived, a live re-enactment of scenes from their most famous fight, a motorcycle ride, live entertainment, Hatfield–McCoy landmark tours, a cornbread contest, pancake breakfast, arts, crafts, and dancing. Launched in 2000, the festival typically attracts thousands with more than 300 runners taking part in the races. In August 2015 members of both families helped archeologists dig for ruins at a site where they believe Randolph McCoy's house was burned. In 2016, the history podcast The Broadsides aired an episode going into detail about the conflict between the Hatfields and McCoys. The 1923 Buster Keaton comedy Our Hospitality centers on the "Canfield–McKay feud," a thinly disguised fictional version of the Hatfield–McCoy feud. The 1938 Merrie Melodies cartoon A Feud There Was depicts a feud between two backwoods families, called the Weavers and the McCoys. It features Egghead as a peace activist - going by the name Elmer Fudd (before he was a hunter) - trying to put an end to the two feuding hillbilly clans. The 1939 Max Fleischer cartoon Musical Mountaineers has Betty Boop wander into the territory of the Peters family who are at war with the Hatfields. The 1946 Disney cartoon short The Martins and the Coys in Make Mine Music animated feature was another very thinly disguised caricature of the Hatfield–McCoy feud. In 1949, the Samuel Goldwyn feature film Roseanna McCoy told the story of the romance between the title character, played by Joan Evans, and Johnse Hatfield, played by Farley Granger. The 1949 Screen Songs short "Comin' Round the Mountain" features another thinly disguised caricature of the Hatfield–McCoy feud, with cats (called "Catfields") and dogs ("McHounds") fighting each other, until a new school teacher arrives. In 1950, Warner Bros. released a spoof of the Hatfield–McCoy feud titled Hillbilly Hare, featuring Bugs Bunny interacting with members of the "Martin family", obviously a reference to a family in the other famous Kentucky feud, the Rowan County War who had been feuding with the "Coy family". When Bugs Bunny is asked, "Be y'all a Martin or be y'all a Coy rabbit? ", Bugs answers, "Well, my friends say I'm very coy!" and laughs. The Martin brothers chase Bugs for the rest of the short and are outwitted by him at every turn. The 1951 Abbott and Costello feature Comin' Round the Mountain features a feud between the Winfields and McCoys. The 2007 movie Pumpkinhead: Blood Feud portrays the feud between the Hatfields and McCoys, but the circumstances of the feud are different. In 2012, Lionsgate Films released a direct-to-DVD film titled Hatfields & McCoys: Bad Blood, starring Jeff Fahey, Perry King, and Christian Slater. Ann Rinaldi authored a historical novel titled The Coffin Quilt, based on a fictionalized account of the feud. The Flintstones featured a feud between the Hatrocks and the Flintstones in the episode "The Flintstone Hillbillies" (aired January 16, 1964), which was loosely based upon the Hatfield–McCoy feud. An episode of the Scooby-Doo show “The Ozark Witch Switch” mentions the Hatfields and the McCoys, with the main villain in the episode being from the McCoy family “Witch McCoy” and her hatred for the Hatfields in the episode. The Andy Griffith Show also alluded to the rivalry in an episode called "A Feud is a Feud" (aired December 5, 1960), in which the feud is between the Wakefields and Carters. The 1968 Merrie Melodies cartoon "Feud with a Dude" has the character Merlin the Magic Mouse trying to make peace with the two families, only to end up as the new target. This short has Hatfield claiming McCoy stole his hen, while McCoy claims Hatfield stole his pig. A 1975 television movie titled The Hatfields and the McCoys told a fictionalized version of the story. It starred Jack Palance as "Devil Anse" Hatfield and Steve Forrest as "Randall" McCoy. The two feuding Virginia families in the 2007 made-for-TV film Pumpkinhead: Blood Feud are called Hatfield and McCoy. The second-season episode Vanished of NCIS takes place in a rural valley in Virginia, the two sides of which are feuding in a manner that Leroy Jethro Gibbs compares to the Hatfields and McCoys. The eleventh episode of Bones season 7, entitled The Family in the Feud, is about a long-running family feud that main character Seeley Booth likens to the Hatfield–McCoy feud. From May 28–30, 2012, U.S. television network The History Channel aired a three-part miniseries titled Hatfields & McCoys, starring Kevin Costner as William Anderson "Devil Anse" Hatfield and co-starring Bill Paxton as Randolph "Ole Ran'l" McCoy, Tom Berenger as Jim Vance, and Powers Boothe as Judge Valentine "Wall" Hatfield. The miniseries set the record as the most-watched entertainment telecast in the history of advertising-supported basic cable. In 2013, NBC commissioned a pilot for a television show updating the feud to present-day Pittsburgh with Rebecca De Mornay, Virginia Madsen, Sophia Bush, and James Remar but it was not picked up. On August 1, 2013, the reality television series Hatfields & McCoys: White Lightning premiered on the History channel. The series begins with an investor offering to set up the feuding families into business making moonshine, and follows the families' attempt to run the business together. In an episode of Modern Family originally aired January 15, 2014, titled "Under Pressure," Cam is working as a gym teacher who has plans to let parents play dodgeball with each other at the school's open house, and wants to divide the two teams into Hatfields and McCoys. The school principal frowns upon this idea, however, Gloria and a competitive mother played by Jane Krakowski decide to settle their score with such a game. Hurriedly Cam proclaims Hatfields for one side and McCoys for the other. The fifth season of My Little Pony: Friendship Is Magic featured an episode titled "The Hooffields and McColts", in which two clans have a longstanding feud over whether to use land for farming or construction. A similar theme was covered in Season 3, episode 9 of Littlest Pet Shop, "Feud for Thought", in which two koalas are at odds with each other but don't know why, other than that their owners are in a feud. In the Ben 10 reboot, a season 3 episode called "Them's Fighting Words!" features a parody of the feud , where the Hartfields and McJoys both claim ownership over a missing corn flute, accusing the other family of stealing it. The villain Hex actually finds it and starts summoning in the family's ancestors, finding out the flute's power increases the more the two families fight each other, though Ben and Gwen are able to quell them by revealing that it was meant to be shared by them, ending the feud. "The Legend of Bad Jim" is a song by the rock band Majungas, which is dedicated to Jim Vance and his influence in the Hatfield/McCoy rivalry. The song "Luckenbach, Texas (Back to the Basics of Love)" written by Bobby Emmons and Chips Moman, sung by Waylon Jennings and Willie Nelson, makes mention of the Hatfield/McCoy feud. In 2018, Mountain Fever Records released a single from their album from Dave Adkins, "Right Or Wrong". The song, "Blood Feud", Written by Dave Adkins and Larry Cordle, is a retelling of the familiar story of the deadly discord between the Hatfield and McCoy families during the Civil War era. Names in red indicate those who were killed as a direct result of the feud. Names in orange highlight intermarriages between Hatfield and McCoy. Ellison Mounts Dr. Henry D.
Numbers in green square brackets [ ] are cross-references to the timeline in the "Deaths" section above. m. Betty Blankenship Sarah "Sally"
^ "McCoy Family Genealogy". hausegenealogy.com. Retrieved September 22, 2014. ^ "From Roots to Nuts: Hatfield Thomas, I". Genfan.com. Archived from the original on September 24, 2015. Retrieved September 12, 2013. ^ Farley, Christopher John (May 29, 2012). "How Realistic is 'Hatfields and McCoys'?". The Wall Street Journal. Retrieved April 1, 2016. ^ Pearce (1994), pp. 59–60. ^ Williams McCoy, Truda (1976). The McCoys: Their Story. Press of the Preservation Council of Pike County. ISBN 978-0-91681-400-7. ^ "Fold 3". Compiled Service Records of Union Soldiers 1861–1865. Washington, D.C.: National Archives. ^ Dickinson, Jack L. (2003). Wayne County, West Virginia in the Civil War. Higginson Book Co. ISBN 978-0-74044-086-1. ^ Cline, Cecil L. (1998). The Clines and Allied Families of The Tug River Valley. Baltimore, Maryland: Gateway Press. ^ Donnelly, Shirley (August 7, 1957). "Hatfield-McCoy Feud 75 Years Old Today". Beckley Post-Herald. Retrieved September 12, 2013 – via WV Culture.org. ^ "Anderson "Preacher Anse" Hatfield". Ghat.com. Archived from the original on March 23, 2012. Retrieved September 12, 2013. ^ "On This Day in West Virginia History - August 7". www.wvculture.org. ^ Rice (1982), p. 26. ^ Kleber, John (May 18, 1992). "Hatfields and McCoys". The Kentucky Encyclopedia. University Press of Kentucky. p. 418. ISBN 978-0-81311-772-0. ^ a b "The Hatfield and McCoy Feud". History.com. Retrieved October 24, 2013. ^ "What in Sam Hill ... started the Hatfield and McCoy Feud? Report from the Adjutant General of Kentucky, 1888". National Guard History eMuseum. Kentucky.gov. May 29, 2008. Archived from the original on June 4, 2012. Retrieved May 31, 2012. ^ Wheeler, Edward Jewitt; Crane, Frank (November 1888). "Current Literature". 1 (5). Current Literature Publishing Company: 417. Retrieved September 12, 2013. ^ "The Hatfield McCoy Feud". Hatfield and McCoy Country. Archived from the original on December 10, 2015. Retrieved December 20, 2015. ^ "Hatfields and McCoys". Encyclopædia Britannica. January 28, 2014. Retrieved December 20, 2015. ^ Rice (1982), p. 70. ^ "Mahon v. Justice, 127 U.S. 700 (1888)". Findlaw.com. Retrieved September 12, 2013. ^ Rice (1982), p. 111. ^ "Game Show Network airs milestone episodes, including Hatfield–McCoy battle". ^ ""Family Feud" episode clip". YouTube. Retrieved September 22, 2014. ^ Shepherd, Jay (May 2012). "Hatfields and McCoys Feud Tour". Pike County Tourism CVB. The Hatfield and McCoy Driving Tour is a self-guided tour that includes all historic sites, both in Kentucky and West Virginia, of the feud. ^ Powell, Kimberly (April 30, 2000). "Hatfield & McCoy - The Reunion They Said Would Never Happen". About.com. Archived from the original on July 11, 2014. Retrieved September 22, 2014. ^ "Hatfields, McCoys trade shots in court". Chicago Tribune. January 29, 2003. Retrieved September 22, 2014. ^ "Hatfield–McCoy Regional Recreation Area". National Recreation Trails. Retrieved September 22, 2014. ^ "Hatfield and McCoy Reunion Festival and Marathon". Holidays, Festivals, and Celebrations of the World Dictionary. Detroit: Omnigraphics, Inc. 2010. ^ "Hatfields, McCoys work together with experts to help pinpoint key battle site in famous feud". The Daily Courier. Kelowna, British Columbia. August 7, 2015. ^ "The Broadsides by The Broadsides on Apple Podcasts". Apple Podcasts. ^ Shepherd, Jay (September 25, 2018). "Randolph McCoy Statue Unveiled at the McCoy Well, Hardy, KY". Pike County Tourism CVB. 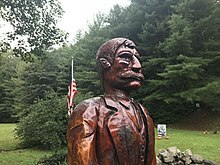 The Randolph McCoy statue stands approximately 8 feet tall, and is situated in such a way to provide visitors with a beautiful photo opportunity. ^ "The Coffin Quilt". HMH Books for Young Readers. April 1, 2001. ISBN 978-0-15216-450-8. Retrieved September 22, 2014. ^ Imbrogno, Douglas (April 14, 2012). "Hatfield & McCoy feud fuels star treatment". Charleston Gazette-Mail. Archived from the original on June 6, 2012. Retrieved April 16, 2012. ^ "Hatfields & McCoys". History.com. Archived from the original on January 25, 2013. Retrieved April 16, 2012. ^ "Hatfields & McCoys' is a ratings record-setter". Associated Press. June 1, 2012. Archived from the original on June 5, 2012. ^ Kenneally, Tim; Molloy, Tim (May 8, 2013). "NBC passes on 'Hatfields,' six other pilots, cancels 'Deception'". TheWrap. Retrieved September 12, 2013. ^ Shattuck, Kathryn (August 1, 2013). "What's On Thursday". The New York Times. Retrieved August 1, 2013. ^ "Hear the Roar". iTunes. ^ a b Rice (1982), Inside rear cover. ^ "Family Group Record – Randolph 'Ranel' McCOY (AFN:1RJ9-QNF)". FamilySearch.org. Archived from the original on June 1, 2012. Retrieved May 26, 2012. Pearce, John Ed (1994). Days of Darkness: The Feuds of Eastern Kentucky. University Press of Kentucky. ISBN 0-8131-1874-3. Rice, Otis K. (1982). The Hatfields and McCoys. The University Press of Kentucky. ISBN 0-8131-1459-4. Dotson, Tom (2013). The Hatfield & McCoy Feud after Kevin Costner: Rescuing History. CreateSpace Independent Publishing Platform. ISBN 978-1-48417-785-3. Alther, Lisa (2012). Blood Feud: The Hatfields & the McCoys: The Epic Story of Murder and Vengeance. Lyons Press. ISBN 978-0-7627-7918-5. Jones, Virgil Carrington (1948). The Hatfields and the McCoys. Chapel Hill: University of North Carolina Press. ISBN 0-89176-014-8. Waller, Altina L. (1988). Feud: Hatfields, McCoys, and Social Change in Appalachia, 1860–1900. Chapel Hill: University of North Carolina Press. ISBN 0-8078-4216-8. King, Dean (2013). The Feud: the Hatfields & McCoys, the true story. New York: Little, Brown and Company. ISBN 978-0-316-16706-2. McCoy, Barry (2012). The Story of the McCoys: The Facts, The Feud, The Fury!. Self Published. ISBN 978-0-615-67030-0.